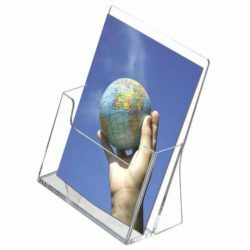 Highly resistant transparent magazine holders. Dispensers can be screen printed with corporate logo. Our pamphlet displays are made of the finest materials while providing the highest level of quality and clarity. COUNTERTOP BROCHURE HOLDER You have 3 different flyers but on your counter you only have space for one magazine holder. If you spread the flyers on the counter without any pamphlet display, it will look unorganized and messy! You won’t be able to know which is where when you want to give away a brochure to a visitor. 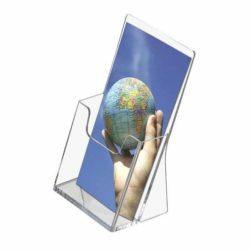 Purchase this plastic magazine holder or also called as pamphlet display with 3 tiers of pocket and sort it out. 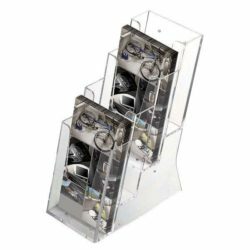 It is a compact plastic rack with rounded pocket fronts. Stylish and cost effective, isn’t it? 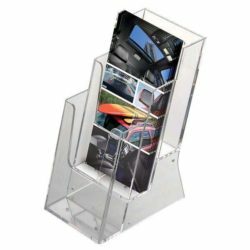 This plastic magazine display also known as injection moulded display will help you to present your brochures neatly for price-point considerations and large quantity applications. Each pocket is suitable for a magazine of 5.5″w x 8.5″h. 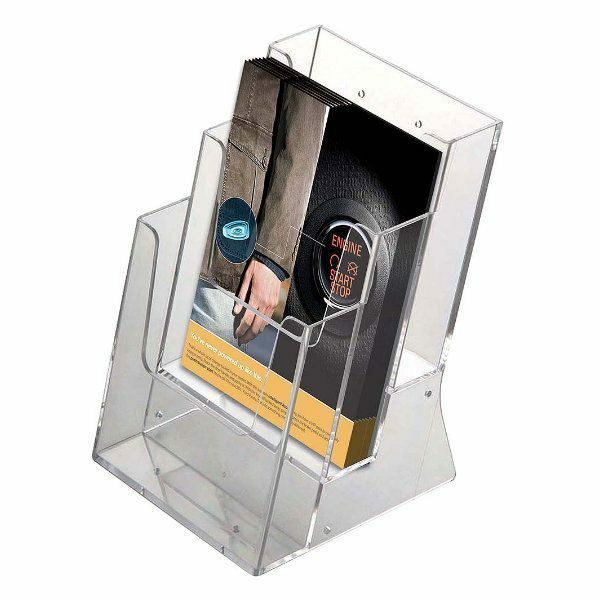 This clear magazine holder or in an other word brochure holder will help you organize as well as advertise perfectly.